Combination skin is that that is both oily and dry, with oiliness occurring mostly in the t-zone area. People with this type of skin may be prone to occasional breakouts as well as wrinkles. In taking care of combination skin, the goal is to balance oil production, keep the skin clean, and minimize the appearance of wrinkles. So our Herbal Facial Oil for Normal and Combination Skin has many jobs to do. Each oil and herb is chosen carefully to work synergistically to tackle all of these issues, resulting in clean, moisturized, and balanced skin. Today, we're going to focus on the oils in this formula. We didn't just choose a bunch of oils and throw them in a bottle… Quite the contrary. Each carrier oil and essential oil in this product was chosen for its unique qualities. We'll start by talking about the carrier oils. Carry essential oils: Since we want to use essential oils in our products, we need other oils to “carry” them into the skin. Essential oils evaporate easily, and could simply disappear on the skin if you tried to use them on their own. Because carrier oils do not evaporate as quickly, they also help to preserve the essential oil until it penetrates skin. Dilute essential oils: As part of their “carrying” ability, carrier oils also dilute essential oils, allowing us to enjoy their benefits with less risk of irritation. Essential oils on their own—because they are so concentrated—are super powerful, and cause irritation or reactions in some people. We can mix peppermint with a carrier oil, for example, and enjoy the cleansing and tightening benefits without risk of irritating sensitive skin. Provide fatty acids to the skin: Most carrier oils are derived from the “fatty” portion of the plant. We’re talking the nuts, kernels, or seeds—those parts that contain fatty acids that help deeply moisturize and plump the look of your skin. A lot of the hydrating ability of our products comes from the carrier oils. Provide antioxidants and other health benefits to skin: In addition to their fatty acids, carrier oils also contain a number of other nutrients that are good for skin, including antioxidants, vitamins and minerals, compounds, components, and more. Not all carrier oils are the same, however, so we choose those that are most beneficial for a particular product. For this oil blend, we chose carrier oils for combination skin, those that help balance, moisturize without clogging the pores, and also provide anti-aging benefits. Grapeseed Oil: Full of healthy antioxidants, vitamin C, and vitamin E, grapeseed is perfect for sensitive skin, as it rarely produces any allergic reactions. It’s light texture hydrates without feeling greasy, and it penetrates easily into the deeper layers of skin. It also helps tighten the appearance of your pores. Coconut Oil: This is one of the most moisturizing oils you can get. It’s also perfect for reducing the appearance of wrinkles; contains healthy antioxidants; and is a good source of vitamins A, C, and E.
Sunflower Seed Oil: This oil contains a good amount of beta-carotene. A unique combination of fatty acids can help the skin look firmer and tighter. Of course, it also moisturizes! Olive Oil: Olive contains fatty acids, like the rest of the carrier oils here, but it also has a unique combination of antioxidants that help protect from environmental stressors. Aloe Vera Oil: A sort of wonder plant, aloe is perfect addition for sensitive skin. It has nearly 20 amino acids that help nourish skin, with a moisturizing quality that doesn’t feel greasy. We chose it for this product particularly because it has great benefits for oily skin. Passion Fruit Seed Oil: This oil comes from the seed of the passion fruit, and is rich in fatty acids that feed the skin what it needs to stay plump and smooth looking. It’s light and non-greasy, and sinks quickly into skin. Because of its high vitamin A content, it can help improve the look of aging skin. Carrot Seed Oil: Carrot seed oil is high in antioxidants that help protect the skin from environmental stressors. It has a unique component called “carotol” that may help your skin look more vibrant. It’s also a balancing oil, giving combination skin the moisture it needs without clogging pores. Tamanu Oil: This oil comes from the kernels found inside the fruit of the Tamanu tree. Extremely soothing, it’s great for sensitive or oily skin. Raspberry Seed Oil: Another oil high in essential fatty acids, raspberry helps replenish moisture, but it’s extremely light, so it won’t clog pores. Cranberry Seed Oil: Full of potent antioxidants, cranberry seed oil is the only oil with a natural ratio of three fatty acids (omega-3, omega-6, and omega-9). That means it’s one of the best penetrating oils there is, absorbing thoroughly into the skin. It’s also got a combination of tocotrienols and toxopherols (forms of vitamin E) that protect the skin from environmental stressors. Buriti Fruit Oil: Drawn from the seed of the buriti palm tree, this oil is rich in essential fatty acids, vitamin E, beta-carotene, and vitamin C, which all work together to moisturize, protect, and soften skin. Other examples of carrier oils that aren’t included in this product are almond, avocado, jojoba, hazelnut, sesame, walnut, and macadamia nut oils. Essential oils are the jewels of the product, and are usually extracted from the leaves, bark, and roots of the plant. They are highly concentrated, and considered to carry the “essence” of the plant within them. 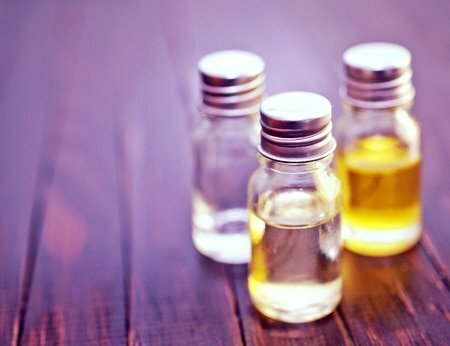 Truth be told, essential oils aren’t really “oils” at all, though they look and feel like light oils. Instead, they are the concentrated volatile aromatic compounds of the plant. Also called “volatile” or “ethereal” oils, they’re usually extracted from the plant through steam distillation, though other methods may be used (like expression or solvent extraction). These ingredients are typically very potent, and a little goes a long way. They are much lighter than carrier oils, and contain many amazing properties. We chose carefully the essential oils in this blend, to help encourage clean, smooth, and young-looking skin. Bergamot Essential Oil: This essential oil is a heavy hitter when it comes to evening out the appearance of your skin. Those with combination skin often suffer from oily spots — this oil, which is extracted from the peel of the bergamot fruit — can help. Chamomile Essential Oil: The ultimate soothing oil, chamomile comes from the flowers of the chamomile plant. It contains a number of components that create a soothing feeling to the skin. Sandalwood Essential Oil: This oil is extracted from the heartwood of the tree. It can help minimize the appearance of large pores, give you a renewed look and works well with oily skin and the occasional breakout. Melissa (or lemon balm) Essential Oil: This light oil comes from the leaves and flowers of the Melissa or lemon balm plant, which is a member of the mint family. It has an uplifting scent, and works well with oily skin. Have you used our Herbal Facial Oil for Normal and Combination Skin? What did you think?